You might find yourself inspired to make your family the biggest Sunday dinner you've ever had when you see our bright green, white, and red Italian Flag Apron. These aprons for proud Italian American chefs and cooks are thigh length, cover you from front to back, and have an adjustable neck for comfort. Put on your new Italian apron in your kitchen and take a photo before it becomes splattered with tomato sauce, flour, and fresh pesto. 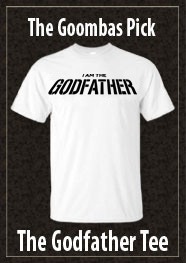 To complete your cooking outfit, be sure to pick up a matching Italian chef hat, which we also have for sale here at Guido Gear. 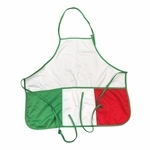 If you have a friend or family member who owns a pizzeria, gift him or her this eye-catching striped Italian flag apron to replace the old worn out one he's probably been wearing for years. It's always in high demand!